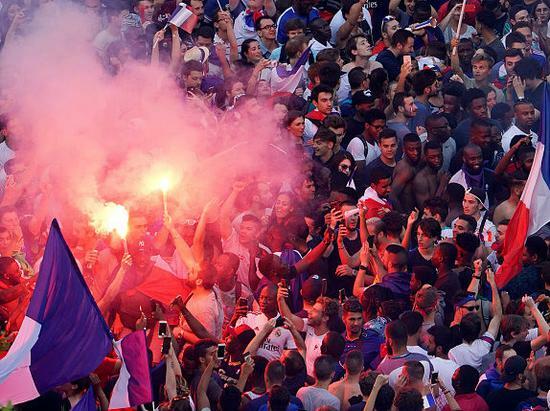 Crowds of happy French fans gathered at Paris' Charles de Gaulle airport on Monday to await the return of their World Cup-winning team. The team was honored with a parade along the Champs Elysees along with a special presidential ceremony. France defeated Croatia by a score of 4-2 in Moscow Sunday to claim the 2018 FIFA World Cup title. More than 300,000 people filled the Champs Elysees, the Arc de Triomphe and Place de la Concorde on Sunday night. They sang the French national anthem, set off firecrackers and sounded horns until the sun rose. One woman dressed in red, white and blue told a French television station, "We had so much fun last night, the city was full of joy, so much celebration. All we want is a wave from the players." Newspapers printed celebratory stories about France's second World Cup title. The country's first victory was in 1998. That year, the competition was held in France. "History Made," said the sports newspaper L'Equipe. Photos of superstar soccer players Kylian Mbappe, Antoine Griezmann and Paul Pogba were widely printed. There were also photos of the team holding and kissing the winning trophy in the rain. The victory has helped bring about a sense of national unity in France. Observers made note of the youth of the team, as well as how many players are of central and North African heritage. Sixteen of the 23 French soccer players are from immigrant families. France has suffered years of tension since a series of attacks by Islamist gunmen during 2015 that left more than 140 dead. Many say the World Cup has helped lift the nation's spirits, even as it remains worried about such threats. The Paris public transportation system also got into the celebratory spirit. It announced that several train stations were being changed for a short time to honor the players and the team's coach, Didier Deschamps. Notre-Dame des Champs station was renamed "Notre Didier Deschamps." Victor Hugo station was changed to "Victor Hugo Lloris" after the captain and goalkeeper. On Monday morning, the effects of Sunday night's partying were still clear. There were many broken windows, an overturned car and drawings on walls that included the phrase "Liberte, Egalite, Mbappe." That is a play on the French national saying, "Liberte, Egalite, Fraternite." French government officials have announced that the World Cup team will receive the Legion of Honor, the country's highest award. The train stations and the airports are really busy. Campuses are usually accessible by public transportation. The article is full of suggestions. 5.The team was honored with a parade along the Champs Elysees along with a special presidential ceremony. The baby's mother escaped from the fire along with two other children. 6.It announced that several train stations were being changed for a short time to honor the players and the team's coach, Didier Deschamps. They only stayed for a short time. It is extremely important to study for a short time every day.